Anything to do with collections of things and museums. What gets displayed? 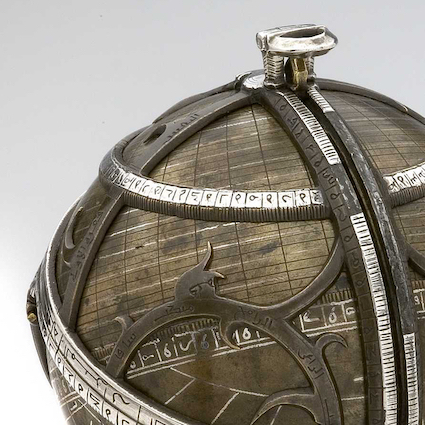 Of the possible objects in a collection, which ones are elevated to the status of displayable? How? In what sort of display case? How are the labeled? How are they illuminated? Where is the collection located—in a basement, a person’s house, a small apartment, an annex to a corporate or governmental complex, a storage lot, a purpose-built structure? Who gets to see the collection? When is it open? Does it cost money or require special permission? Who pays for the maintenance? 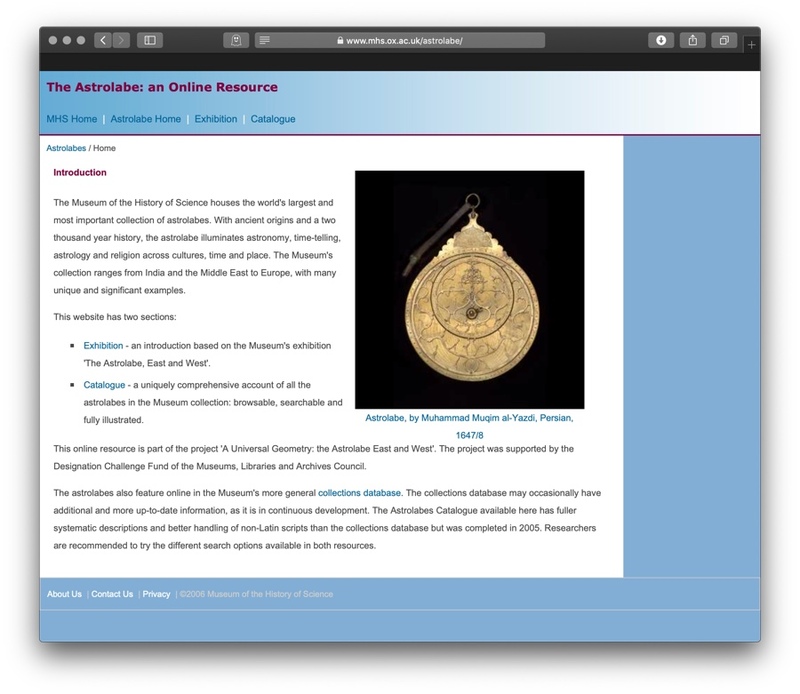 How is the museum portrayed or marketed in brochures, pamphlets, ads? How is the visitor’s path through the museum directed—by the layout of cabinets and displays, by some sort of self-guided tour, by a human guide? Three recent museums allow us to think again about how collections are still used to create identity and assert authority. 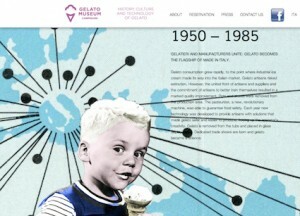 Carpigiani’s recently opened Gelato Museum tells the noble story of gelato from ancient Mesopotamia to 20th century. Like many museums, this represents a particular history in order to create or embellish or celebrate the founder’s own story. In this case the founder, Carpigiani, uses the museum to generate historical authority for its own products—gelato machines and it gelato university courses. The museum is at the Carpigiani headquarters in Bologna. See The Guardian’s article. In Colorado Bill Koch’s personal wild west museum is nearing completion. He has been creating his own vision of an Old West town, a patchwork of relocated historic buildings stand amongst new structures, designed to look old and fill out Koch’s vision. 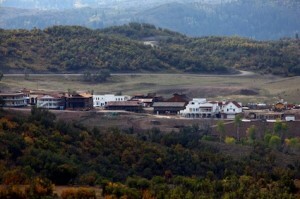 When the buildings are finished Koch will fill them with his collection of Western memorabilia. Koch’s Old West town is a fiction insofar as it never existed and much of it isn’t authentic, if we assume authenticity extends beyond the surface and includes such characteristics as age. Koch’s Old West town is a fiction created to realize some boyhood dream, to undergird his own autobiographical fiction. Koch resembles a modern Emperor Maximilian I, who created histories out of whole cloth to legitimate his cultural authority. Koch, like Maximilian, has created the artifacts he needs to fill in his picture. For Koch as for Maximilian authenticity is measured not by the artifact’s historical origin but it’s role in completing the picture of the past, its ability to fill in an otherwise missing visual or conceptual detail. The history of ancient cities was written in stone. But for Las Vegas, stone just wouldn’t do. 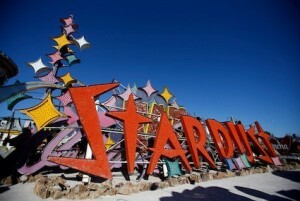 No American city has a past as colorful or as flamboyant as Las Vegas. The city’s story was blazed against the desert sky. Handed down over the decades in brilliant color, incandescent lights and the glorious glow of neon. YESCO is proud of its contribution to the legacy of light in the most razzle-dazzle city in the world. If it worked for Renaissance princes and monarchs, why can’t it work for Las Vegas, Bill Koch, and gelato? 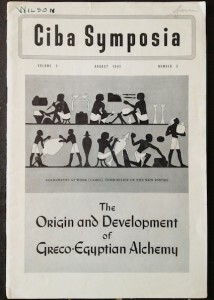 A Ciba Symposia pamphlet on Greco-Egyptian Alchemy from 1941. I know nothing about Ciba Pharmaceutical Products and had never heard of the company until I found this pamphlet in a box of old books. Apparently, Ciba Pharmaceuticals produced pamphlets on various topics related to pharmaceuticals and chemistry. This one contains a number of articles by William Jerome Wilson, who contributed to a number of Ciba Symposia on alchemy—one on Chinese alchemy in 1940 and one on the mystical developments in alchemy in 1942. The Ciba Symposia was clearly a vehicle for marketing Ciba pharmaceuticals. Here’s a large ad for Coramine. These pamphlets were clearly a vehicle for marketing Ciba’s pharmaceutical products. This pamphlet includes three large ads for different medicines: the stimulant Coramine, the steroids Metandren and Perandren, and the antispasmodic Trasentin. 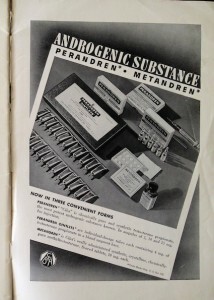 Ciba’s two steroids, Perandren and Metandren. I can’t help but appreciate the detail and care of the ads in this pamphlet. Everything from the typography to the stylized images conveys both authority, efficacy, and modernity. I am, therefore, intrigued by Ciba’s use of alchemy here as a means of marketing its pharmaceuticals. This wasn’t the first or the last time a Ciba Symposia focused on alchemy. 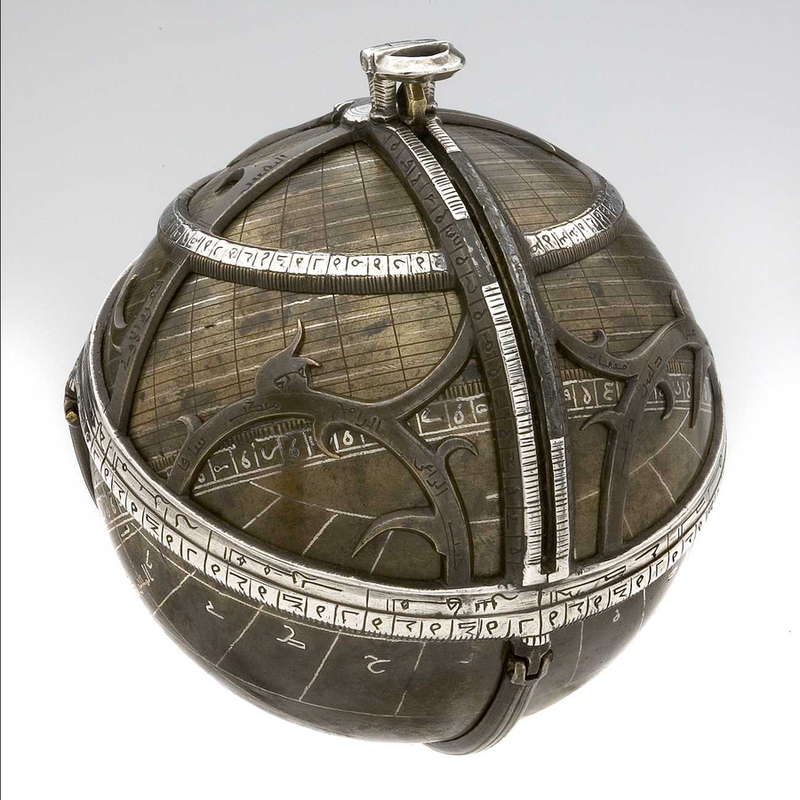 What made alchemy useful in this context? Anybody interested in pursuing these questions should start at the Chemical Heritage Foundation. 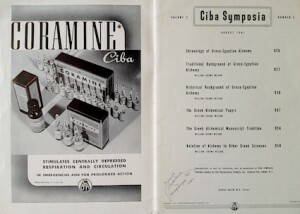 Not only do they appear to have a number of other Ciba pamphlets, as this search indicates, they have other Ciba materials and, no doubt, boxes and boxes of other mid-century pharmaceutical literature. 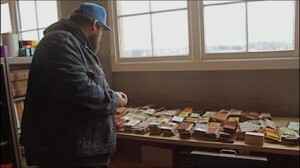 Aaron Draplin arranges his memo books according to whatever suits his fancy, size, color, or just in stacks of roughly the same height. Aaron Draplin has a large collection of memo books—mostly mid-century advertising material for seeds, fencing, fertilizers, and other farming related products. In a video posted at Field Notes he talks about his interest in and motivation for collecting memo books and about the arbitrariness of collecting and organizing anything. The video is at The Memo Book Archive as are scans of 300 or so of his memo books. Nelson Molina poses with his collection, from NY Times slide show. 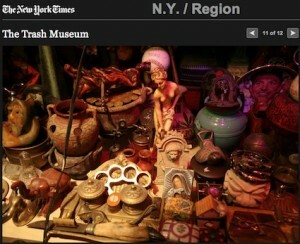 Another article in the NY Times raises questions about the nature of features of a museum. This time, a NYC sanitation worker, Nelson Molina, has spent the last 20 years collecting things that other people have thrown away. His collection now includes around 1000 pieces of art that he has arranged in the second floor of a Sanitation Department garage. 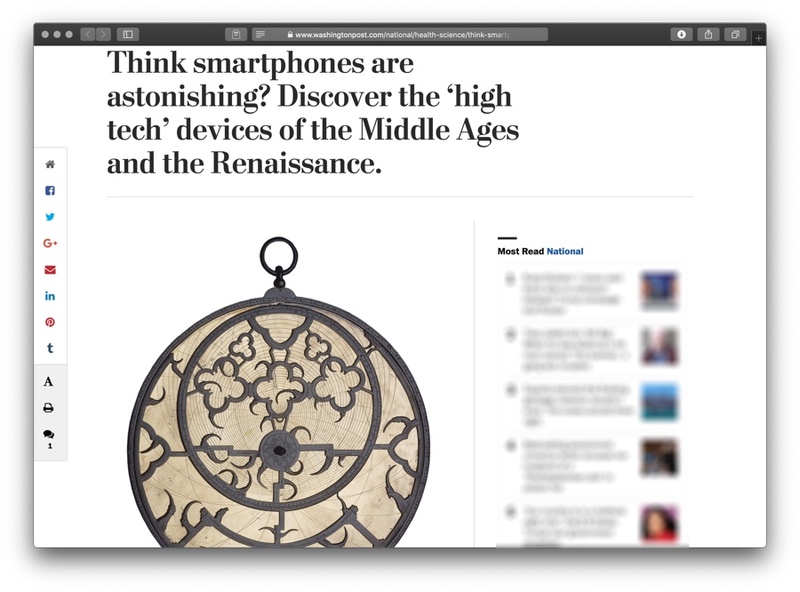 The endowment effect apparently makes us value things we possess or can imagine possessing. 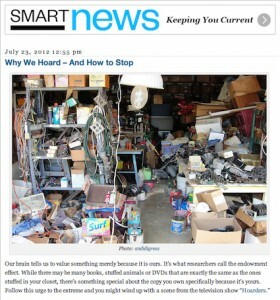 Over at Smithsonian.com’s Smart News blog a recent post tries to explain why we collect things, or at least why we hoard things: Why We Hoard and How to Stop. The basic claim seems to be we value things we own or wish to own—there may be a circularity here that tends toward vicious. Researchers call this the endowment effect. I am not convinced this the endowment effect is acting in Mr. Molina’s case. He doesn’t, after all, owns any of the objects he collects and arranges.